Epson New Zealand has launched the STYLUS PHOTO RX510, a six colour, photographic printer that includes a high resolution scanner and transparency unit, photo restoration software, and a range of PC-free direct printing features. The STYLUS PHOTO RX510 is the photo enthusiast's all in one digital photo lab, capable of not only printing directly from the memory card of most digital cameras, but also scanning in slides and negatives to produce quality photographic prints. And the STYLUS PHOTO RX510 features Epson's user friendly PhotoQuicker 3.5 print management software, PRINT IMAGE Framer and Print Image Frame Designer, providing a host of versatile and useful applications at home and in the office. With a print resolution of 5760 x 1440 Optimised dpi (using Epson's Resolution Print Management Technology) combined with 3pl [picolitres] microdroplets of new high performance dye-based ink, as well as the ability to print BorderFree edge-to-edge photos on a variety of paper sizes up to A4, photo prints from the STYLUS PHOTO RX510 will always have a professional finish. The STYLUS PHOTO RX510 has standalone features equivalent to many photocopiers, allowing users to make quick and easy "reprints" of photos, or to make an easy colour copy of that important document without turning on their PC. The scan resolution of up to 2400 x 4800dpi gives clear and detailed results and the built-in transparency unit enables users to scan up to 6 negatives (one strip film) or 4 slides at the one time. With Epson Scan software, scanning is made easy, allowing users to select the scan mode that suits their level of experience and the degree of control they wish to have over the scanning process. The STYLUS RX510 also features Epson's Photo Restoration technology that allows users to scan in old faded photos and negatives, substantially restore their colour on screen, and the print them immediately. Digital camera users will find printing quick and easy as direct print options on the STYLUS PHOTO RX510 includes support for Memory Stick, CompactFlash, Smartmedia, MultiMedia Card and IBM Microdrive. The six individual ink cartridges mean users only need to replace each colour when as it is needed. The STYLUS PHOTO RX510 is a stylishly designed device for the desktop with some smart features including a cover for the card slots to protect them from dust (which can contribute to the corruption of cards). The printer lid has a hinge that has a soft close effect, to minimise wear and tear. The Epson STYLUS PHOTO RX510 is available now through Epson's dealers for the recommended retail price of $649. 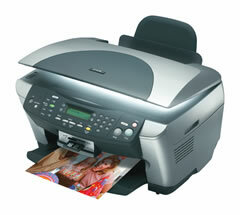 For full specifications on this and other Epson multifunction printers please refer to www.epson.co.nz.